Realme smartphones will soon be available in Lazada. Realme Philippines chief operating officer Jacky Chen and Lazada’s country chief business officer Emmanuelle Chavarot. Realme, an anticipated new brand of smartphone that will arrive in the Philippines on November 29, has partnered with e-commerce giant Lazada to make available its latest handsets to online Filipino consumers. Realme is an emerging smartphone brand established six months ago in China by its founder Sky Li together with a group of young people who have rich experience in the smartphone industry across several countries. In just a short span of time, the smartphone brand has already made success in India, where it reached the No. 2 spot in India’s online smartphone market. Realme Philippines chief operating officer Jacky Chen said the brand sees more room for growth in the Philippines as it targets the young generation who likes gadgets that are stylish, functional and powerful—yet priced just within their budget. “We see the requirements of the emerging young generation and the opportunities these entail. We started in India six months ago, but South East Asia is one of the most-important overseas markets for Realme. We are now present in Indonesia, Thailand, Vietnam, Malaysia and in the next few days, the Philippines. We are very glad that we can now cater to a very vigorous market – the Filipino youth – who contributes tremendously to the growing trust of Filipinos in online shopping platforms. We are making sure that our products are available to this market and offer them at remarkably affordable prices,” said Chen. Emmanuelle Chavarot, Lazada’s country chief business officer, expressed his excitement about the brand’s entry in the Philippines. “As a young smartphone brand, Realme offers an exciting portfolio that Lazada is only thrilled to bring to Filipinos online. Despite being just six months old, the smartphone brand made waves in the recent 11.11 Online Shopping Festival in Lazada Southeast Asia. 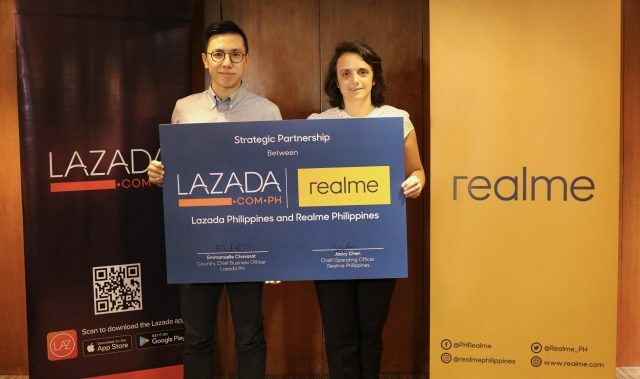 Now in the Philippines, Realme and Lazada will conduct an in-depth, strategic level partnership to provide the best products with affordable price to the young generation. We believe we can deliver more together,” said Chavarot. Chen said they are optimistic that Realme will be one of the major propellers of the e-commerce market in the Philippines as the brand already made success in its recent launches globally across the same business channel. In fact in India, Realme became the country’s fourth most popular online smartphone brand. Realme likewise posted record-breaking online sales in its launches in other Asian countries, including Indonesia. It also topped the 11.11 online shipping festival across Southeast Asia. Realme combines top-notch performance with modern style in all its devices—features that Filipino youth would love to have in a smartphone. Realme’s products are designed based on the needs of the youth today, making the integration of essential, powerful technology and trendy designs attainable, according to Chen.